When most people go to the trouble and expense of importing two cars from overseas, they are usually not shipping 1950s Soviet cars retrofitted onto German luxury sedan platforms from Russia. In this case however, that's exactly what someone did. Behold the GAZ M-20. Produced from 1948-1956, these cars were nicknamed "Pobeda" which means "Victory" in Russian. The nickname came to be because the first tests were done on the pre-production versions of the car when victory in World War II seemed likely for the Soviet Union. The 2.1 straight-four engine that came in the Pobeda produced 50 horsepower and brought the car to a top speed of 65 miles an hour. 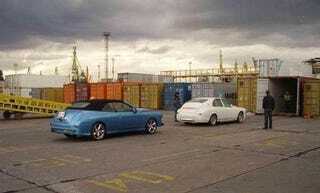 Spotted on the docks waiting for shipment to America, these two examples should be a little bit faster. From the pictures shown it looks as though little more than the body of the original Pobedas remain. The White hardtop example appears to have started life as a BMW E34 Chassis 5 series. The Green Convertible version on the other hand looks like it rolled out of a Mercedes Benz dealership as a W202 C Class.